For the 13th time in 30 races, there are exactly 40 drivers entered in Sunday’s race, marking the first time since Bristol and Darlington that the series will have two consecutive full fields. These will be the same 40 teams from Dover as Derrike Cope’s StarCom Racing #00 is not entered. Following a last-place finish for electrical woes at Dover, Motorsports Business Management will make two consecutive Cup races for the first time in 2017. Following a 17th-place finish by Carl Long in the Monster Energy Open, the team had originally planned on running the Coca-Cola 600, but withdrew. Timmy Hill is slated to drive on Sunday and will run double-duty for MBM in XFINITY alongside Chad Finchum. Gray Gaulding rejoins Premium Motorsports’ Cup effort for the first time since Loudon with returning sponsor Low T Centers backing his #55 Toyota. Gaulding finished 27th at Charlotte in the spring while driving for BK Racing. Gaulding’s return moves Reed Sorenson back to Premium’s #15 Exchange of America Toyota. Sorenson finished 30th with that team in the Coca-Cola 600. Both drivers will look for a solid finish after both Premium’s cars had mechanical issues at Dover. BK Racing has retained its Dover lineup with Corey LaJoie in the #23 Dr. Pepper Toyota and Brett Moffitt in the #83 Champion Machinery Toyota. LaJoie turned heads last Saturday in XFINITY when he challenged for a Top 10 before an ill-timed penalty left him 15th. This will be Moffitt’s first Cup start at Charlotte since 2015, when he finished a track-best 30th for Front Row Motorsports. LaJoie finished 32nd in this year’s Coca-Cola 600 after engine trouble. 42 drivers are entered in Saturday’s XFINITY race, the most entries since August at Bristol. 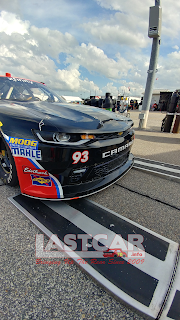 Once again, this includes the preliminary withdrawal of GMS Racing’s #96 for Ben Kennedy, raising doubts about whether that car will run any of the remaining events in 2017. The only team missing from the Dover list is Biagi-DenBeste Racing’s #98, whose driver Casey Mears finished 18th that day. Penske Racing has brought back the #12 team for the first time since Watkins Glen. Sam Hornish, Jr. drives the PPG-sponsored Ford for the first time this year in what will be his fifth XFINITY start of the year and first since Kentucky. King Autosport will field two cars for the first time since that same Kentucky race. Behind the wheel of the #92 will be Josh Williams, whose most recent series start was his last-place run at Daytona in July. Mario Gosselin is entered as Williams’ teammate in the #90, marking his own first start in the series since a 31st-place run at Chicagoland. Obaika Racing has once again re-appeared on the list, but as yet does not have a driver for their #77 Vroom! Brands Chevrolet. Since the team last took the green flag at Fontana with Stephen Leicht, Obaika has incurred one DNQ and withdrawn three more times, most recently at Elkhart Lake with road racer Gregory Vandersluis. The team has, however, made four starts at Charlotte with a best finish of 23rd by Ryan Ellis in 2015. Alex Bowman is slated to make his first of two XFINITY starts for Chip Ganassi Racing this weekend as he takes the controls of the #42 Hendrickcars.com Chevrolet. It will be Bowman’s first start in the series since last year’s Homestead finale, when he came home 14th for JR Motorsports. Last, but certainly not least, RSS Racing has again entered three cars. Joining Ryan Sieg in the #39 and a yet-unknown driver in the #38 will once again be Jeff Green in the #93. Following his last-place run after a hard crash at Dover, Charlotte will be Green’s first opportunity to score his record 100th last-place finish in the XFINITY Series.